Barn Owl Cottage01263 821445work01263 821445fax Self-cateringBarn Owl Cottage is mid 19th century traditional brick and flint listed building. Originally a stable block, it has been converted to a comfortable self catering cottage with its own secluded garden, patio and off road private parking. The accommodation is all on one level and is well furnished with two bedrooms, one double leading to a small single. The living accommodation is open plan with a living area, kitchen and dining area. The living area is furnished with a leather sofa/sofa bed and easy chair. There is a flat screen TV with freesat and DVD player, free Wi-Fi. The kitchen area/dining area has a table and 4 chairs, four ring hob, microwave, small electric oven/grill, fridge and washing machine. All necessary cutlery, crockery and cooking equipment/utensils are supplied. The French doors lead onto a paved terrace with wooden table and 4 chairs and a small, private garden. The bathroom has an electric power shower, sink and WC. All towels and bed linen are provided free of charge. The property is centrally heated. The owners live next door to the property so are on hand if guests need any assistance or advice during their stay. Situated on the edge of The National Trust's Sheringham Park in the beautiful quiet village of Upper Sheringham designated an Area of Outstanding Natural Beauty, Barn Owl Cottage is ideally placed to explore the stately homes, villages, countryside and coastline of this unspoilt area of North Norfolk. 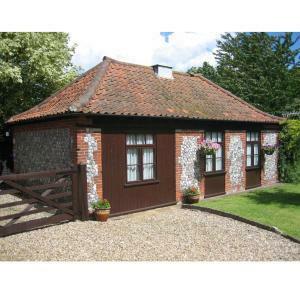 Barn Owl Cottage is mid 19th century traditional brick and flint listed building. Originally a stable block, it has been converted to a comfortable self catering cottage with its own secluded garden, patio and off road private parking. There is a large choice of pubs, restaurants and tea rooms within a short drive. Ground floor bedroom. Cycle storage available. Children welcome from any age. From the A148 (Holt-Cromer Road) take the B1157 signposted Sheringham Park and Upper Sheringham. Follow the road down the wooded hill and Lodge Cottage is the first house on the left in the village sharing a driveway with the Dales Hotel. Whilst the living accommodation is all on one level the doorways aren't wide enough to allow wheel chair access.